We recently noticed an issue with two Nexus 4 units that we happen to have in the office - one of them had a screen with noticeably warmer color temperature. What's all this supposed to mean? Well, when it comes to screen color temperature, 6500K (Kelvin) is considered the ideal. Anything above this number means that colors will gravitate towards blue (or cold). Anything below 6500K will be more "reddish." So the numbers that we've measured prove that one of the units we have here has a more bluish screen than the other. Why is that? From time to time it becomes necessary or preferable to alter certain product specification if engineers and management feel the change improves the functionality or usability of the device. 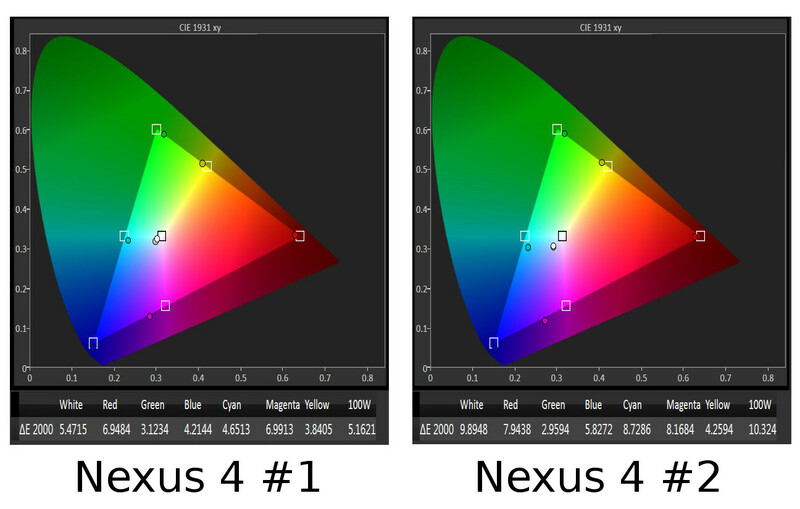 During the production run of the Nexus 4 – I assume after production of the black Nexus 4 [#2] you bought and before the Nexus 4 White [#1] -- the tuning of the display was re-calibrated to give off a slightly warmer tone. The difference is subtle and really only noticeable if two devices with different calibrations are compared side by side or measured using sophisticated equipment, as was what happened in your case. So that explains why the two displays look different - at a certain point of Nexus 4 production, LG has decided to tweak the screen so that colors appear a bit closer to the real deal. That's why later Nexus 4 units have slightly better screens. However, the following question naturally occurred to us: "Isn't it possible to adjust the screens of the earlier Nexus 4 units by issuing a software update?" There is no easy way for normal users to access the setting level to be able to recalibrate the display. Today’s smartphones are configured a specific way to give average consumers a specific user experience and the way the phone’s display looks is certainly part of that. Well, you can always try using a screen calibration app of some sort in order to fix the color balance of your screen, but we do feel that most people out there will stick with what comes out of the box, which means that we'd like to see smartphone and tablet manufacturers try even harder when it comes to making the most out of the available screen technology. In this case, it's actually a good thing that LG has tweaked the Nexus 4's display so that it gets better, though it can't be denied that owners of an earlier Nexus 4 won't be so happy that their screens will have to remain the same. We do want to point out that this isn't an LG-only issue. We've seen many other examples of different units of the same model (from other manufacturers) having slightly different screens, so the fact that we're discussing an LG device here doesn't mean that it's the only company to do that. In fact, we want to thank LG for being so open and willing to help us out in clearing things up! "Today’s smartphones are configured a specific way to give average consumers a specific user experience and the way the phone’s display looks is certainly part of that." That's a good one LG. So why is N4's screen calibration fu*ked up? To their defense the Optimus G seems to have a good calibration. I reckon its Google's fault because the Nexus 7 also seems to have a bad screen calibration. I was concerned about the screen before I bought it, having come from SAMOLED screens previously. After first glance, I was hooked, the screen on the N4 is beautiful. Not so good defense by LG. I have one of the early ones with the horrible yellow tint. Nexus 4 Display Control app from Google Play, problem solved.